Like all vertebrates, snakes, mice and humans have in common a skeleton made of segments, the vertebrae. But a snake has between 200-400 ribs extending from all vertebrae, from the neck to the tail-end, whereas mice have only 13 pairs of ribs, and humans have 12 pairs, in both cases making up the ribcage. In the latest issue of Developmental Cell, researchers from the Instituto Gulbenkian de Ciência, in Portugal, reveal that, contrary to what was thought, making ribs is not the default state for vertebrates, but is actually an active process of balancing the activities of a remarkable class of genes - the Hox genes. It was thought that the rib less region of the mouse embryo was the result of a rib-inhibiting programme, driven by Hox10 genes. Indeed, previous studies, in which Hox10 genes were inactivated in the embryo, generated mice with extra ribs. 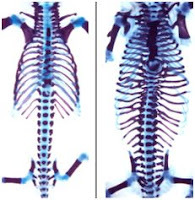 However, by forcing another class of Hox genes (Hox6) to be activated in future rib-less regions of the mouse embryo, Moises Mallo and his team bred mice that also have extra ribs, both in the neck area, and from just after the rib cage, all the way down to the tail, resembling a snake-like skeleton. The researchers went on to unpick the genes involved in this process, and came up with yet another surprising finding: that the whole process relies on first hitting so-called muscle genes in the embryo, which then provide signals to switch on the 'rib' genes to make both ribs and muscle, in a coordinated process. According to Mallo, 'Our findings reveal a more complicated process than we would have imagined, but one that makes perfect sense, from a functional and evolutionary point of view: it is no good to make ribs without muscle, so, in the embryo, the production of both ribs and their associated muscles is under the control of a single and coordinated mechanism. Incredible find! Last April I went to Barcelona, and visited Gaudi's Casa Batlo, there I saw this exhibition of his small scale models and amongst these where the skeleton (or a section to be precise) of a snake vertebrae. I watch it with much intrigue and thought about precisely this -why don't we have ribs all over the vertebrae?- I mean it would be sort of an advantage to have all of our organs protected by a full rib-cage just like the snakes'. And now I read about the Hox gene... amazing stuff, what an intricate design we living organisms are.